In answer to the question, “What went wrong for the Americans at the Ryder Cup?”, one could almost say, “Everything”. While it was bad, it wasn’t the complete and total disaster some are making it out to be. There were bright spots for the U.S. - Jordan Spieth and Justin Thomas paired well together, taking 3 out of 4 matches and Webb Simpson and Tony Finau each nabbed a couple of points, including big wins in the singles. But the rest was pretty bad. And maybe perplexing too since so many of the American players were on form throughout the latter part of the season. Brooks Koepka won two majors this summer, Tiger Woods completed his comeback last week with a win at the Tour Championship and Bryson DeChambeau won two FedEx Cup playoffs in the preceding weeks. Thomas, Finau, Simpson, Rickie Fowler and Dustin Johnson also contended in August and September. It’s easy to say that Europe just played better but that won’t stop the second guessing going on this week among golf fans and the media. Even the players got into it with some sore loser reaction. Patrick Reed had snarky comments about who he was paired with and that he was sat out of two of four matches on Friday and Saturday, while news broke on Monday about a near fist fight between good friends Brooks Koepka and Dustin Johnson during the European celebrations on Sunday night. Obviously, all is not right in the American camp. Yes, Europe played better. But they also played smarter. 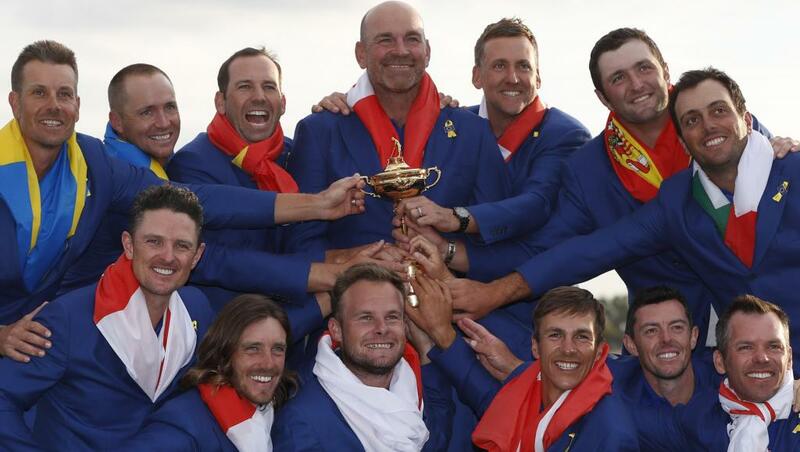 And the U.S. repeated the same mistakes that have cost them in past Ryder Cups too. So, what are the Americans going to do about it? They can wait until 2020 and take their chances on a wide-open Whistling Straits course and home field advantage. But the record since 1985 shows Europe winning 12 of 17 Ryder Cups in that span including 5 on American soil and giving up just one in Europe. Home field isn’t near the advantage for the U.S. as it is for the competition. This probably falls under the Play Smarter heading. European Captain Thomas Bjorn allegedly had Le Golf National set up with narrow landing areas and deep, deep penal rough to counter the American’s overall advantage in driving distance. However, once the U.S. players saw the course and realized there’d be a stiff penalty to pay for missing fairways, they could have adjusted and hit long irons and fairway metals. Few of them did and it cost them. Woods, Johnson, Koepka, Watson and Mickelson are among the longest hitters on the PGA Tour. They all have majors and lots of victories. You’d think they could have figured this one out. The coaches too. Match play is all about gaining advantage. Missing fairways hands all advantage to the opponent immediately. Every year you see Team Canada coaches leaving some of the best NHL players off their team. Sometimes the rationale is “we can’t take everybody” but sometimes the unspoken reason is “we don’t want that guy because he’s not a team player”. Phil Mickelson and Tiger Woods are the two best golfers on the planet in the last 20 years but both have rotten Ryder Cup records and questionable impact as teammates. This year Woods looked disinterested; Mickelson just looked lost. None of that is good for team chemistry. Would Xander Schauffele, Kevin Kisner or Matt Kuchar have made a difference? Hard to say but they’d all bring more positive energy and enthusiasm. It’s impossible when you have team leaders who can’t or won’t lead. Fortunately, Woods and Mickelson’s time is probably up but future Ryder Cup captains need a DELETE button. Change the qualifying process so that the captain can pick a team from among the top 15 qualifiers instead of having to take someone with bad mojo just because he automatically qualified. Note: Captain Jim Furyk used two of his captain’s picks on Woods and Mickelson, not likely because he knew it was a smart thing to do but because he would have been roasted if he didn’t. He also could have used the DELETE button on Bubba Watson and Patrick Reed. Everybody must understand that it’s not about celebrities and the biggest stars, it’s about building the best team. Much is always made about the European team’s chemistry, about how they all grew up playing and travelling together and being friends. And how they want to win the Ryder Cup more than the Americans. This year, the Euros all got on WhatsApp to stay in touch and build even more camaraderie heading to France. Maybe team chemistry and bonding are overblown but the U.S. could use some of it. Strong teams don’t throw their captain under the bus as Mickelson did to Tom Watson in 2014 or whine openly about playing or pairings as Patrick Reed did this year. Jordan Spieth and Justin Thomas are good friends and play well together. The same goes for Tommy Fleetwood and Francesco Molinari (also known as Moliwood) for Europe. These days, the top European players are all over the world as much as the Americans, yet they still find a way to pull it all together around the Ryder Cup. Maybe collective embarrassment will be the bonding agent that makes the Americans get it together. Leading up to the Ryder Cup, only Justin Thomas adjusted his schedule to play in the French Open and gain some experience on Le Golf National. It paid dividends as he was the leading point getter for the U.S. team. Conventional thinking says that PGA Tour calibre players can get an understanding of a new golf course in a couple of days – they do it all the time on Tour. At the risk of repeating myself, this is not the same. It’s match play. Shot selection is different. You must adjust to your opponent and counter his play. That’s where course knowledge really comes in handy. In four years, the Ryder Cup will be in Rome. Likely not a single American player has seen the course yet. Hopefully, their captain will rectify that with a few trips to Italy.